The questions that follow will lead you to figuring out the average monthly streamflow for the Animas River at Durango. We will measure this in cubic feet per month, then convert to cubic feet per second, the most common units used for streamflow in this country. The first step is to estimate the area of the drainage basin. The actual watershed is irregular in shape but we will estimate the area by a rectangle, using Google Earth. Follow these steps to estimate the area. 1. Open Google Earth and enter “Durango CO” in the ‘fly to’ box. 2. Pace markers at the four corners of the rectangle, using the latitude and longitude given below. To do this, click on the marker icon and then adjust the latitude and longitude as needed. You may need to zoom out and shift north to the place the northern markers. 3. Now select “ruler” under tools. You will use this to measure the sides of the rectangle. Select the “line” tab, and measure in miles. Center the small viewing window as close as possible to the pin of marker 1, click to start your line, move to marker 2, click again to complete it. The measurement will appear. Repeat the process to measure the other sides. Remember that you are only estimating the area, so if your measurements aren’t exactly the same for opposites, take an average. 4. 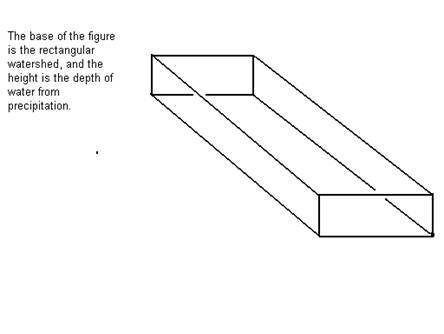 Finally, compute the area of the rectangle. This gives you the area of the drainage basin. The answer should be approximately 700 square miles. Use this for the remainder of your computations. Information you’ll need to answer this question is bulleted below, refer to the figure shown, then answer the question below the figure. The area of the drainage basin, or watershed, for the Animas from source to Durango is roughly 700 square miles. The total average annual precipitation, including water from snow, over this region is 22.17 inches. Question 1: What is the area of the watershed in square feet? Question 2: Convert the annual amount of precipitation from inches to feet. Find the total volume (in cubic feet—use your answers to #1 and 2) of water from rain and snow that falls on the watershed each year. Question 4: Only 74% of the rain actually reaches the river bed to contribute to its streamflow (all the rest of the water is evaporated or diverted for other uses). What is the annual streamflow for the Animas River? Question 5: On the average, how much water flows down the river each month? Each second? Your answer to # 5 is the average streamflow for the Animas River at Durango; the units should be cubic feet per second, or cfs. Do you think that the methods used here would be accurate for predicting future streamflow? Do you think that you can accurately predict daily, or monthly, streamflow from annual streamflow, particularly for the Animas River? Why? What variations in precipitation might affect monthly streamflow? How would variations in streamflow affect the stream bed, or the land around the stream? You might refer to the website http://pubs.usgs.gov/of/1992/ofr92-129/hcdn92/hcdn/ascii/monthlya/region14/09361500.amm, average the data given there, and compare to your answers.